Powers/Abilities: She had the standard powers and weaknesses of a vampire. Including superhuman strength and durability, physical transformation, the need to consume human blood, weakness to religious icons, etc. (Marvel Comics Presents I#133/4) - For some time Tessa has been feeding on runaways. Cloak and Dagger were after her, but she was always one step ahead of them. One night she entered an alley where Cloak had recently beaten up two mean thugs. She killed one thug and drank the blood of the other one. After she was finished she transformed into a bat and flew away. A short time later she ran screaming into the arms of Cloak and Dagger. She told them that something dragged her sister into a house. Tessa smiled as the heroic duo teleported right into her trap. Dagger fell through a trapdoor into the cellar. Cloak teleported to her and Tessa tried to seduce him. She used her psychic vampire powers to stop Dagger from interfering. Then she turned her attention back to Cloak. She liked Cloak for his killer instinct and helped him to embrace his own powers. Cloak lost control and Tessa was shocked by the painful darkness within Cloak. He attacked her and Dagger tried to save Tessa from Cloak's hunger. Cloak regained control after a few words of Dagger, but he was still mad at Tessa for destroying his control. He wanted to punish her by bringing her into his cloak forever, but Dagger stopped him from doing it. (Marvel Comics Presents I#133/4 - BTS) - They brought Tessa to Dr. Strange afterwards. The delivering of Tessa to Dr. Strange was never seen in the story, but they were talking about it and I think Cloak and Dagger did it. They are still the good guys. 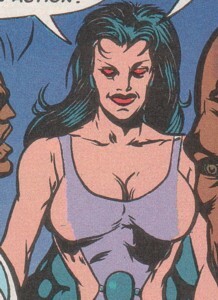 Her last name was revealed in Vampires: The Marvel Undead#1 (December, 2011).